"Christ died for sins once for all", and then a few verses later says, "Christ suffered physically" (4:1) and a bit earlier we hear "Christ suffered for you" (2:21). Peter is saying what the New Testament states again and again, as in Romans 5:8, "While we were still sinners that Christ died for us!" We have heard words like "Christ suffered" and "Jesus died" so many times that I wonder whether we have lost the true impact of what these simple, yet very complex words, are saying to us. It’s only when we look at other words connected with Jesus suffering that we start to get an idea of what is being talked about. Words like ‘abused’, ‘rejected’, ‘beaten’, ‘whipped’, ‘mocked’, ‘pain’, ‘agony’, ‘wounds’, ‘crown of thorns’, ‘nails’, ‘put to death’. When we hear these words we realise that the word ‘suffer’ is a very intense word. We talk about the pain that a paper cut sends through our finger to our brain or the suffering that a backache causes us or a twisted ankle. But this kind of suffering pales into insignificance when we talk about the extreme suffering that Jesus experienced. It’s true some people have suffered extreme pain to a similar degree as Christ suffered and maybe it’s these people who have a sense of something of the suffering that Jesus went through. But here is the dilemma with which the New Testament confronts us. 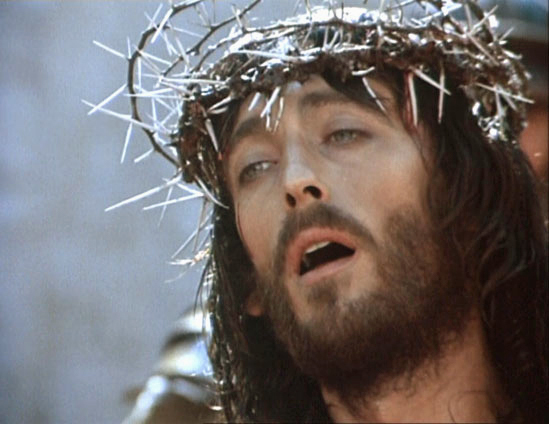 When we say that Jesus suffered, we are saying, God suffers, God feels pain. To our human mind this is not possible. When we think of God we think of him being so different to us. We are mortal, God is immortal. We are weak, God is strong. We have limited knowledge, God knows everything. We are sinners, God is holy and perfect. It would be natural to follow on and say, "We suffer, God doesn’t suffer". When we see Jesus on the cross, blood dripping down his face, his naked body bleeding from the cruel whipping, hands and feet nailed to its beams, it’s hard to imagine that this is God. In faith we can see beyond all that and realise that this is God's love at work on the cross bringing us salvation and eternal life. Through the vulnerability and weakness displayed on the cross, God brings his love, power and grace to us. We may think that this is a strange thing for God to do but it’s all about God's love for us. Peter goes on and reminds us of another strange way that God comes to us when he says, "baptism now saves you". Again this is a very strange thing for God to do. Very unimpressive. Very boring. Very ordinary. But very God! Water, very ordinary water renews, cleanses, brings us under God's grace and claims us as his children. When we look at water it’s hard to see how God can do anything fantastic through something so plain, so uninteresting. But that’s the way God often chooses to work in our lives. He calls ordinary people like you and me. In baptism God calls people who have ordinary jobs, ordinary lives, and live amongst ordinary people and joins their name with his name. In this way we are joined with the powerful God who empowers and enables ordinary people to do extraordinary things. There is a message here for our lives as Christians. The question that confronts us then is this: Are we Christians ‘from a distance’? Just as Jesus didn’t deal with humanity’s problems from a distance neither are we called to deal with the hurts, troubles and pains that afflict the people around us from a distance. Often it means getting down to be with them and understand them and getting dirty to help them. Is this what Jesus was getting at when he washed his disciples feet on the night before he suffered and died? He was a true servant, getting down on his knees, taking dirty feet into his hands and washing them. This was a foreshadowing of the kind of servant role that he will take up as he suffers on the cross. Doesn’t he also say, "I, your Lord and Teacher, have just washed your feet. You, then, should wash one another's feet. I have set an example for you, so that you will do just what I have done for you"?